The use for faceplate dogs is either to secure, position, or both, a workpiece that requires to be mounted onto the faceplate for machining. 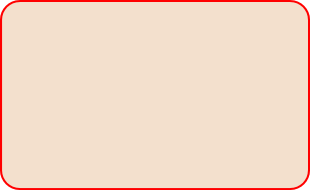 For more detail regarding their use see my pages on using the faceplate. 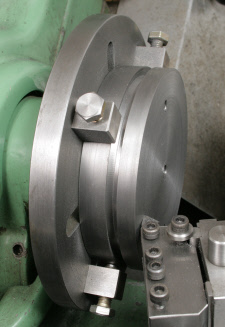 Photograph 1 shows a bearing block being bored to take a spindle. The flat piece of steel on the faceplate (fence) enables a second block to be added and then bored at the same height. The four faceplate dogs are the only method of securing the part but they also serve to adjust the block's position so that the hole bored is central across the width. The situation in Photograph 2 is quite different. 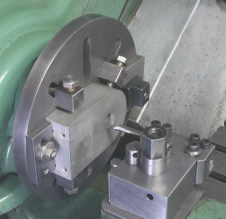 The largish piece of cast iron is secured to the faceplate using two screws from the rear of the faceplate into tapped holes into the workpiece. However, whilst making it concentric with the lathes spindle was not critical, it needed to be close. Having placed it onto the faceplate and added the screws it was next to impossible to move such a heavy item into the position required. With the screws only lightly tightened to enable adjustments to its position to be made with a soft hammer, the screws would loose their grip and the part fall to the lower end of the faceplate’s slots . If then the fixing screws were tightened further then the part would not move, even with a quite heavy hit with the hammer. This problem was overcome by adding the faceplate dogs which enabled slight adjustments to be made until the part was sufficiently accurately placed. when the fixing screw on the rear were fully tightened. The faceplate dogs could have then been removed as the screws were more than adequate for the task. However, I chose to leave them in place. I should add that faceplate dogs should not be used with parts that project appreciably from the plates surface. As a guide, no more that the narrowest dimension of the part’s footprint. Say for a part with a footprint of 80mm x 40mm, then no more than 40mm. This becomes more important for parts that create an intermittent cut. Manufacture is easy so I have given no explanation of a possible method. Whilst the drawing gives dimensions for those seen in the photograph, smaller and or larger sizes may also be considered worthwhile.